Outstanding Crochet: Snowflakes earrings. New life. I made some before and put starch spray on them, but still, they were kind of soft and started to curl in a while. So a sewed very thin wire on back side around the flakes and it's just perfect now. I love them. Are the patterns available on this blog? All I see are the pictures. Can I buy the pattern anywhere? Hi, I am sorry. If you are interested in these earrings, this is not my pattern and I can't share it. I hope to sell my own designs, but for now I am in the situation I can not accept any payments in this country, so it's just pictures. I am truly sorry. 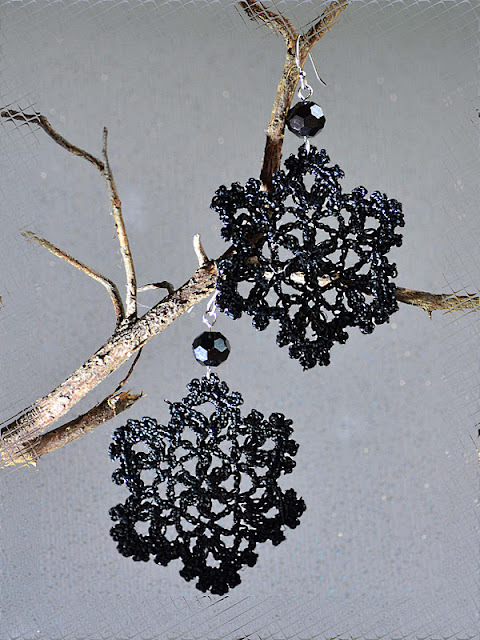 I am making white snowflakes for Christmas but these look stunning in black especially if you had an artificial white tree. Of course they look lovely as earrings as well.